Insight and frank, friendly advice on overcoming infertility — from two women who have lived through it all. We are bombarded by images of blissful older mothers, such as Madonna and Celine Dion. But ‘Hollywood’ articles about pregnancy and fertility at middle age gloss over the tremendous amount of financial, emotional, and physical effort faced by couples struggling to conceive. 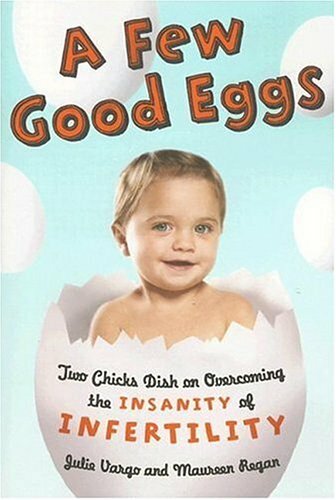 In this warm, funny, empathetic book, journalist Julie Vargo and literary agent Maureen Regan — women who have experienced personally almost every aspect of infertility — give readers a glimpse into what to expect when you’re not expecting. Hormones, sperm counts — nothing is too personal for these two outspoken women! Ranges from technical to humorous and everything in between. What are good, snappy comebacks to the question, ‘Why aren’t you pregnant?’ What is the difference between gonadotrophin releasing hormone and progesterone? Should you freeze your eggs? These questions and many more are answered, and in the tone of a couple of good friends. Between them, the authors have gone through hormone treatments, miscarriages and multiple inseminations — so they know firsthand the rollercoaster ride of trying to achieve pregnancy.